Here is one of my more unique paintings. 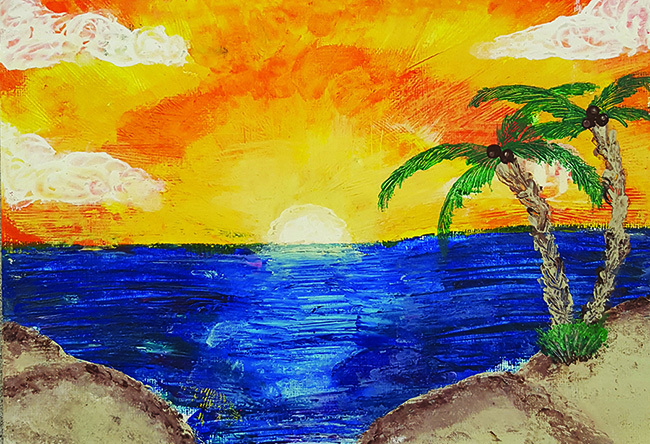 What is seen here is a small tropical scene that i painted using just acrylic paint and the fingers on my hands. I have been very interested in the art of finger painting for some time not only because it was so fun to do as a child, but also because i was fascinated as to how the professional artists got so much detail into one piece of artwork using just their finger. I am very pleased as to how it turned out. 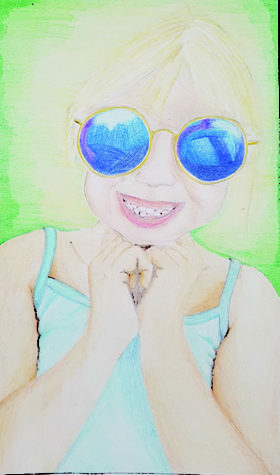 Here is one my favorite portraits that i have endured, or adding shading and dimension, using colored pencils. The picture is of my next door neighbor who is very photogenic. Portraits, I feel, are one of my strengths in art, mainly due to the fact that my best pieces are the ones where i look at something and attempt to copy it. 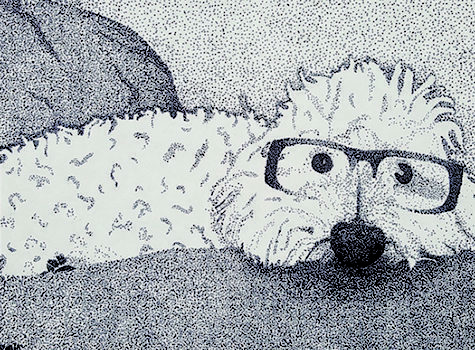 Here is a drawing of my dog, Jack, wearing my glasses. I used a technique called stippling to create the shadows of this drawing. One might think that placing all these dots would take a tremendous amount of time, but this piece only took about a week or so. This is one of my early, and also one of my favorite acrylic paintings. 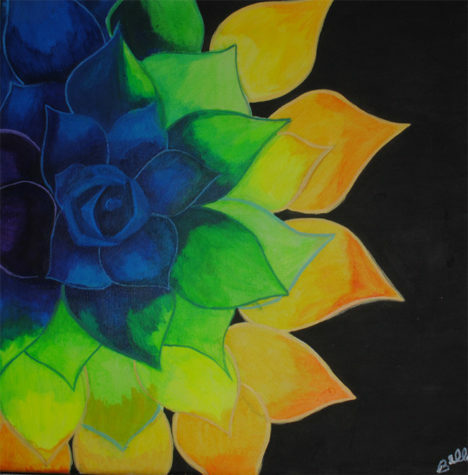 I found a picture of a multicolored flower but found it hard to have multiple colors on one petal. So i decided to just have the petals gradient outward from the center of the flower. I was pleased by the way it looked it the end. It somewhat reminds me of a mood ring.